The Crown Grill is Regal Princess' steak and seafood specialty restaurant. In previous reviews of the Crown Grills on other Princess ships, we have always given this venue high marks. If anything, Regal Princess surpassed its counterparts. In 2006, Princess opened its first Crown Grill on the Crown Princess. The line had had steakhouses before on its ships but the concept here was to present a more sophisticated dining experience. Its décor and style were modeled after the steakhouses of New York City and Chicago - - upscale but not stuffy. In addition, the menu included more seafood items than had been offered at earlier steakhouses. An immediate success, Crown Grills were included on Emerald Princess and Ruby Princess. The concept was also rolled back into earlier ships such as Caribbean Princess and Grand Princess. As a result, it has become increasingly difficult to find one of the predecessor restaurants (i.e, the Sterling Steakhouse. The New Orleans-influenced Bayou Cafes on Island Princess and Coral Princess are a different concept). Naturally, Crown Grills were included in the design of Royal Princess and Regal Princess. However, the Crown Grill on this class of ship differs from those on previous classes because it adjoins the Wheelhouse Bar. Both venues have a similar dark wood atmosphere. There is no dividing wall between the two venues and so one room just flows into the other. Similarly, the live music from the Wheelhouse Bar drifts into the Crown Grill. As a result, you have live background music. On the evening that we were at the Crown Grill, a trio was playing jazz and 20th century standards made famous by Sinatra and his contemporaries. Service at this Crown Grill was friendly and attentive. In addition to presenting the menu, the staff made recommendations. Whether you follow them or not, recoomendations indicate that the server has given some thought to the meal and is interested in seeing that you enjoy your meal. 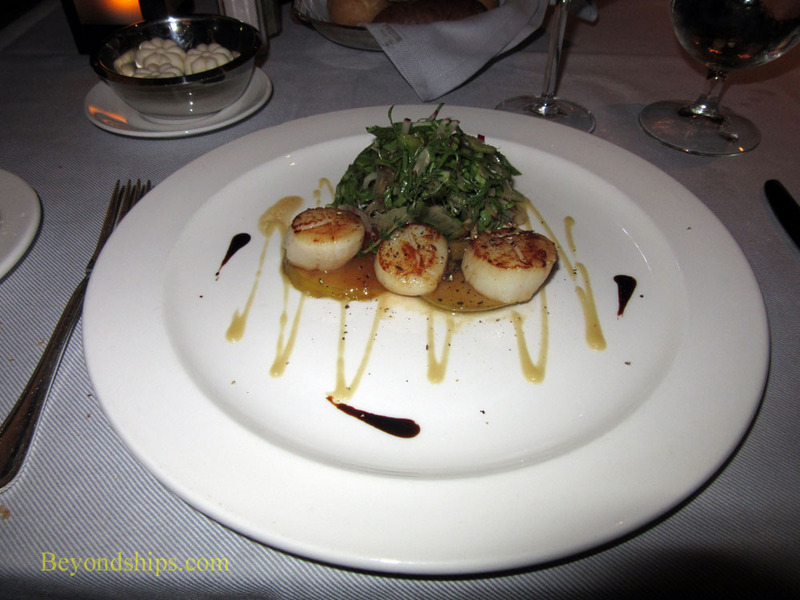 For a starter, we had the recommended pan-seared Pacific scallops. The danger with scallops is that they can be rubbery and flavorless. However, the Crown Grill successfully avoided this pitfall, the scallops were tender and flavorful. In addition, the “golden delicious dressing and a Morocian glaze” promised on the menu enhanced their natural flavor. 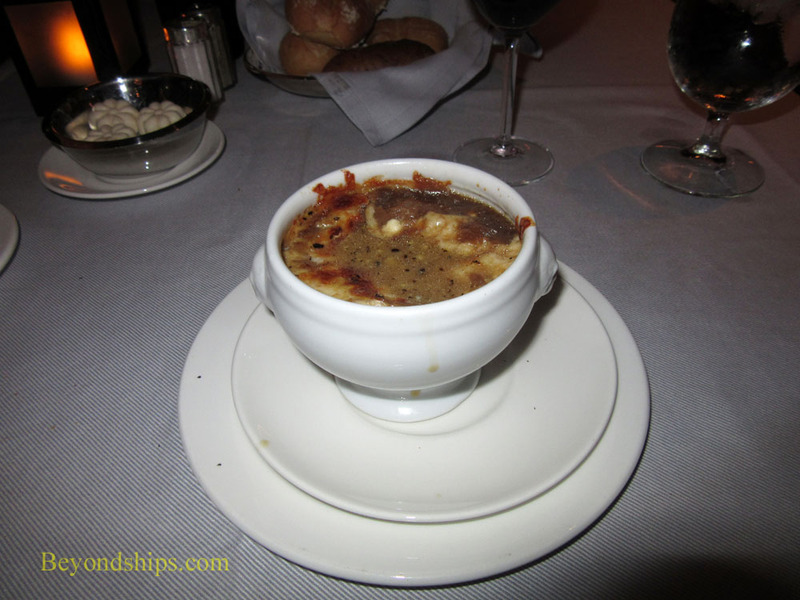 Next, came an old friend that came to our noitice many cruises ago - - the Black and Blue Onion Soup. Essentially, this is French onion soup with blue cheese in place of the Gruyere cheese. The substiution of a stronger cheese makes the dish much more powerful. In addition, it makes for a better contrast with the sweetness of the onions. It also allows the dish to include a bit of Jack Daniels bourbon without dominating the soup. For the main course, we ordered the Porterhouse. This cut is tantalizing because it offers a filet mignon on one side of the bone and a sirloin steak on the other. However, it is difficult to cook them together, either the filet is left underdone or the sirloin is overcooked and tough. Therefore, it is usally best to get one or the other. But since the staff at the Crown Grill were visibly proud of their Porterhouse, we decided to give it a try. Above: Pan seared Pacific Scallops. 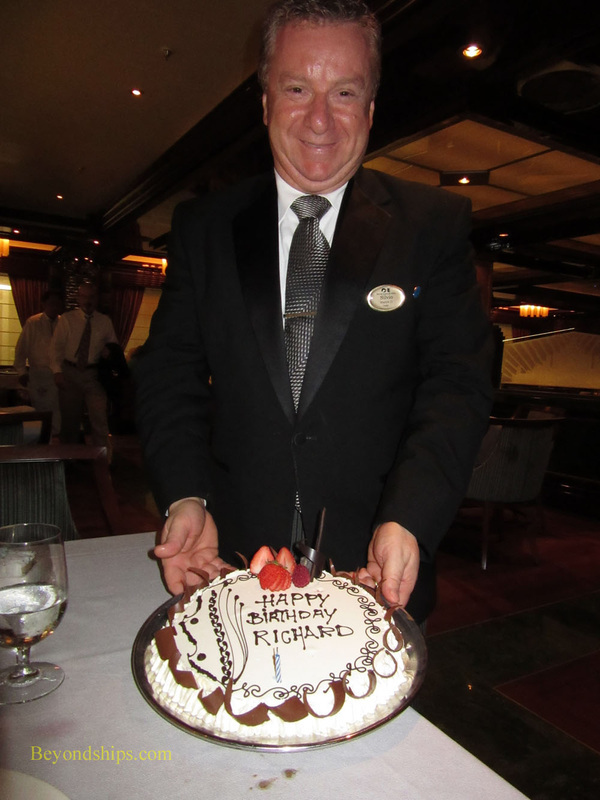 Above: Maitre D'Hotel Silvio Zampieri presents a cake. It greatly exceeded expectations. Both sides of the steak were done perfectly. The filet was tender and the sirloin full of flavor. The taste was further enhanced by various gourmet salts offered by the Crown Grill. Each of the three types of salt has its own characteristics with the Hawaiian Black the boldest and the Smoked Applewood the sweetest. Dessert was pre-empted by birthday celebrations. A nice cake arrived and the staff showcased their musical talents, all of which was very enjoyable.